Friday was a sad day for many loyal radio listeners in Thunder Bay. Veteran newsman Rick Smith signed off for the last time, heading into retirement following a 46-year career in the broadcasting industry. Friday's final show, was a very emotional hour for the legendary host. September 29, 2006, is a day that will be remembered in Thunder Bay broadcasting history, as the day that legendary newsman Rick Smith, signed off for the last time. Smith ventured into the city in 1968, starting off in television, as the critically acclaimed host for the famous Rick Smith Show, and writing his weekly editorial column 'One Man's Opinion'. Rick describes his last day at work, as surreal. After a 46-year career, its hard for him to believe that it has all come to an end. During the open mic show Friday, Rick actually had the tables turned and he was the guest on his own show. The program was hosted by Dougall Media president, Fraser Dougall. The two laughed and reminisced, while former colleagues and friends took the opportunity to call in with memories and best wishes. 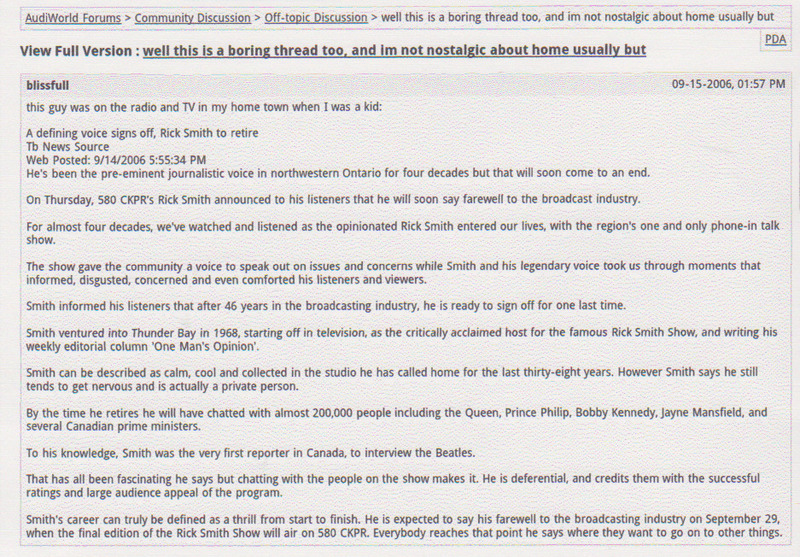 So as Rick Smith heads into retirement, what's ahead for him is still uncertain, but what's behind is well documented… over 200,000 on-air phone conversations, enough commentary to compose close to fifty novels, and the legacy of being the 'Voice of News' in Northwestern Ontario for almost four decades.